Between 2010 and 2012, the UK Department for International Development (DFID) increased its total nutrition-related aid spending by 39%, with US$1.15 billion disbursed to 37 countries over these three years (and US$120 million in global or regional programmes). This aid focused on two countries: India for projects addressing nutrition directly (nutrition-specific aid) and Ethiopia for projects where nutrition was an element (nutrition-sensitive aid). Some 41% of total nutrition aid in this period went to India and Ethiopia, amounting to US$467 million. Activities where improving nutrition was the primary objective accounted for 12% of the total (US$148 million). 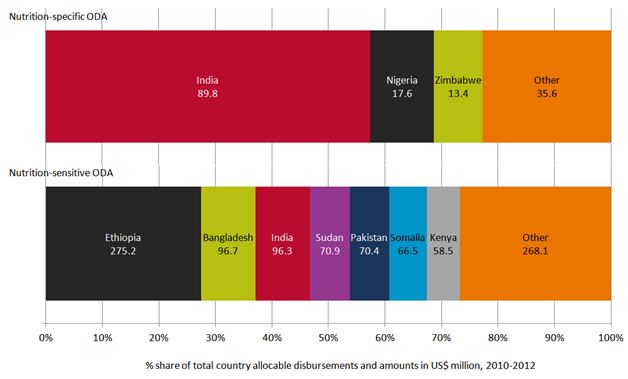 These funds reached 11 countries, with India by far the largest recipient with US$90 million – 63% of country-allocable disbursements. Aid to projects where nutrition was a dominant or partial component was much larger, at US$1.1 billion. These funds were more widely spread, going to 37 countries. But these funds were still concentrated, if less so than nutrition-specific projects. Ethiopia received 28% of country allocable aid (US$275 million). India and Ethiopia have very high levels of under-nutrition, with almost half of children having stunted growth as a result: 48% and 44% respectively. All figures presented in constant 2011 prices. Totals include disbursements to multinational, regional and global programmes. Shares are calculated as a percentage of total country-allocable disbursements. See full paper for details. DI calculations based on OECD DAC CRS data and DFID project documentation. Data on proportion of stunted children is from the WHO data health repository, 2006 and 2011.